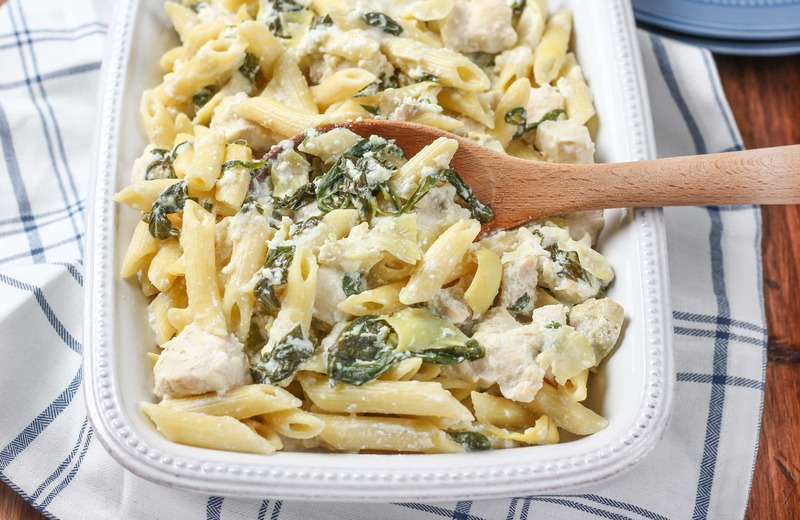 This Spinach Artichoke Chicken Penne is a rich, creamy pasta dish that is ready in 40 minutes! A perfect meal for busy weeknights! I think we could all use a little help getting dinner on the table this time of year. Even those of us who enjoy spending time in the kitchen don’t always want to spend any more time than necessary preparing meals. There are just too many other things to do. So, if there’s a way to make dinnertime easier, I’m all for it! 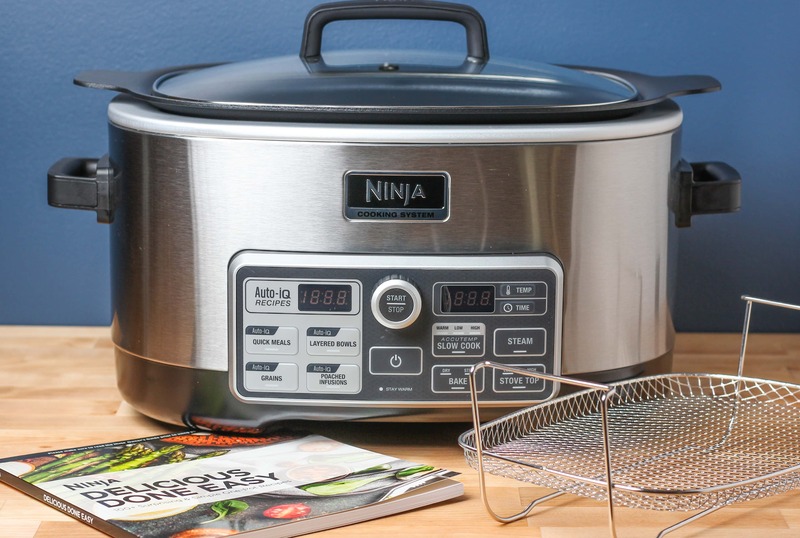 Enter the Ninja® Cooking System with Auto-iQ™. It’s a multi cooker that is four appliances in one! It can act as a slow cooker, a steamer, a stovetop, and an oven! I’m all for having appliances that can do more than one thing. So what makes it different than other slow cookers? 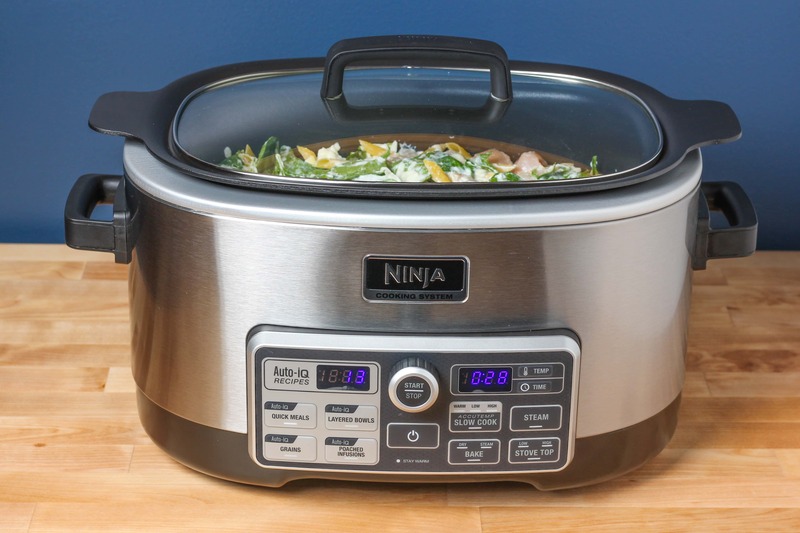 Unlike traditional slow cookers that only heat on the sides, the Ninja Cooking System with Auto-iQ uses bottom, side, and steam heat to achieve even cooking. One of my favorite things about this appliance is that I can do the prep work for my slow cooker recipes right in the same appliance. I can sauté my meat in the same appliance that is going to cook the meal! I know it’s only an extra pan to dirty, but that extra step of digging out another pan early in the morning just to sauté the meat can seem like a lot some days. That, and fewer dirty dishes always make me happy! My other favorite feature is the Auto-iQ™ technology that has over 80 pre-programmed recipes. You just add your ingredients, hit the start button, and you’re done! There is a cookbook included that gives you inspiration for all of the different options that you can take advantage of. 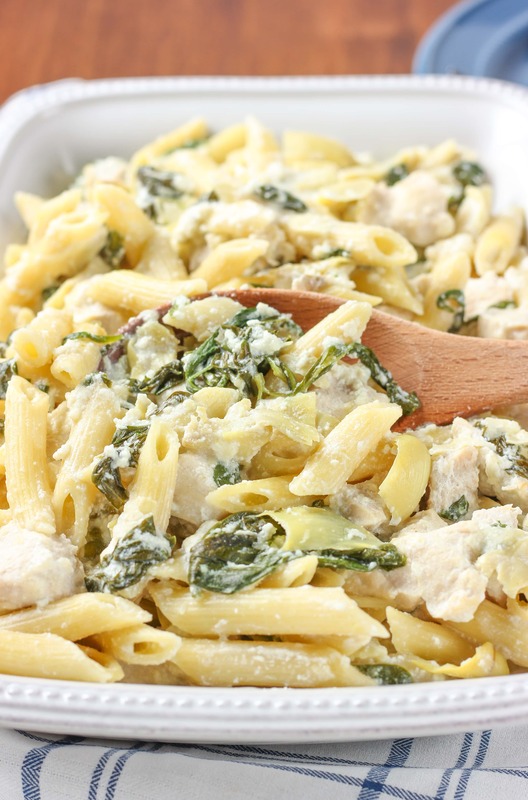 That’s where the idea for this spinach artichoke chicken penne came from. While I love slow cooker recipes, a lot of them take a long time to make, and I don’t always plan far enough out in advance to have the meal ready in time! 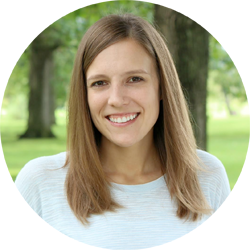 I love that you can use the Auto-iQ quick meals function and have meals ready in 30 minutes. And apart from adding the ingredients to the pot, it’s completely hands off! If you’re like me and a little wary of how pasta turns out in recipes like this, don’t be. The pasta cooks perfectly. It’s not crunchy or mushy! The al dente noodles are coated in a rich sauce made of ricotta and mozzarella. I threw in some crushed red pepper flakes to the sauce for a bit of heat, but feel free to leave it out if spice isn’t your thing. 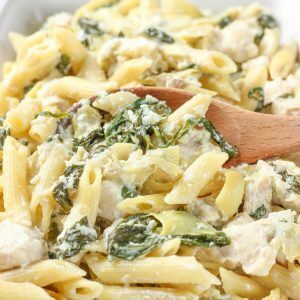 To make the meal a bit more filling, I added chicken to the classic spinach and artichoke combination. To top it off, a bit of fresh grated parmesan is added when serving! Hearty comfort food that requires little effort from me is always a bonus on a busy weeknight! Check out below how you can win one (1) of twenty (20) Ninja® Cooking Systems with Auto-iQ™! Or you can use my code “JESSICA15” to receive 15% off your own Ninja® Cooking System with Auto-iQ™ ! Code good from now until Dec. 31, 2017. Place all ingredients into the pot. Stir to combine, press the mixture down so that most of the noodles are covered in liquid, and cover pot. Select Auto-iQ Quick Meals: Recipe 13 and press the START/STOP button. When finished cooking, you can serve immediately or allow to sit for 10-15 minutes to get a thicker sauce.. If you want to thicken the sauce right away, stir 1 tablespoon of cornstarch into ½ tablespoon of cold water and stir into penne. Taste and add salt and pepper to taste. Sprinkle with shredded parmesan, if desired, and serve. Don't have a Ninja Cooking System with Auto-iQ yet? 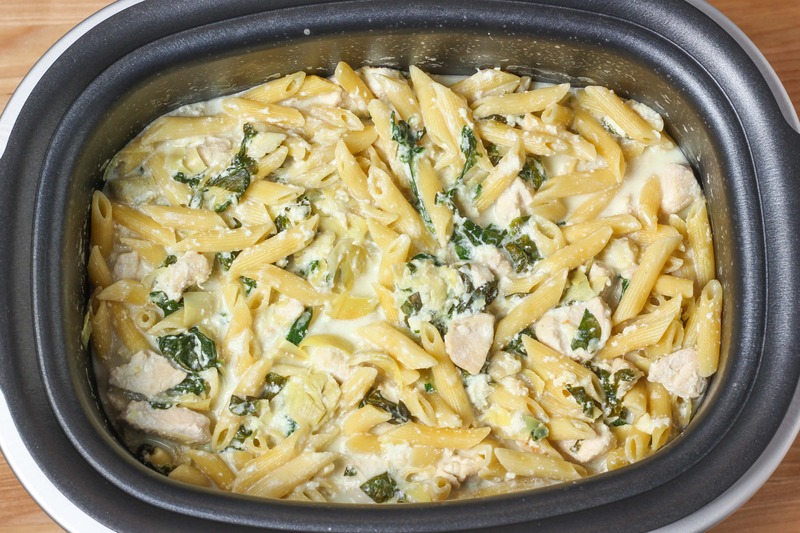 Place all ingredients in a slow cooker and cook on high for 2½ - 3 hours, or until pasta is tender. Giveaway runs from November 13, 2017 – December 31, 2017. Winners will be randomly selected from all program entries and Ninja will facilitate fulfillment of the 20 winning prizes. For more information and recipe inspiration, connect with Ninja® on Facebook, Instagram, Twitter, and Pinterest. Or on their website at www.ninjakitchen.com. 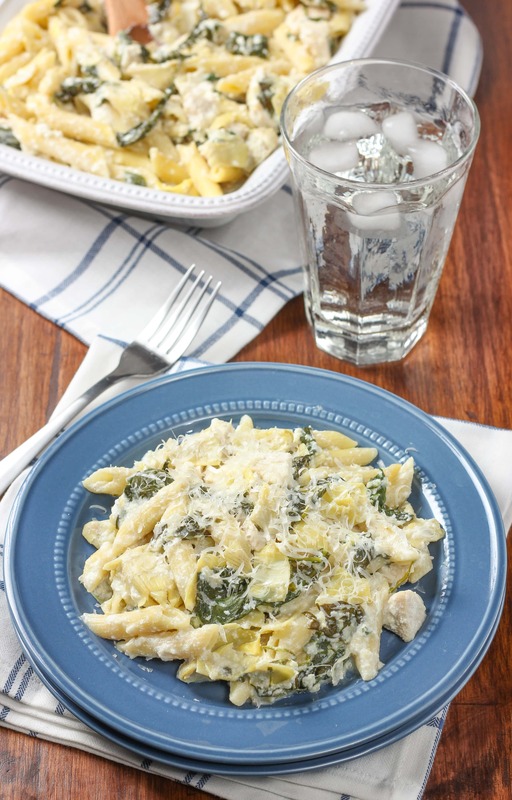 I love spinach and artichoke dip, so putting it in a pasta dish sounds amazing to me. Proper comfort food. That Ninja cooking system looks like a huge time saver. Can’t wait to check it out. 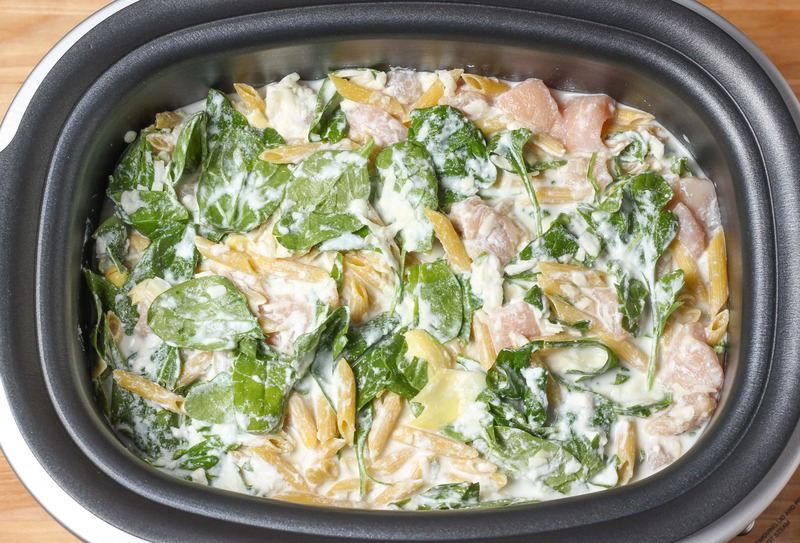 Not only does your chicken penne look delicious, but I’m intrigued by the ninja slow cooker!! I have got to make your delicious recipe and perhaps I’ll give my old slow cooker to my niece and get or the ninja!! That looks like an amazing machine! Whoever wins is going to be so happy!